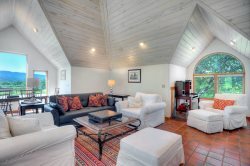 Completely remodeled Golf and Ski condo at Tamarron Lodge. The studio condo sleeps up to four people comfortably with one king size bed and one queen size sleeper sofa. Completely remodeled with updated bath, flooring, furnishings, linens and more. The kitchen includes updated appliances and cookware. Please be aware that there is a new toaster oven in leu of a full oven.